One of the most recognizable of the Galapagos Islands, Sombrero Chino name means "Chinese Hat." It's easy to see why: this islet off of Santiago is shaped like an old-fashioned Chinaman's hat, a gently sloping cone rising out of the clear Galapagos water. Because of its distinctive shape, Sombrero Chino has fascinated visitors as long as they have been coming to Galapagos. It's one of the smallest Galapagos Islands but don't be fooled: it has a terrific visitor site with an unforgettable view! Like most of Galapagos, Sombrero Chino is volcanic in origin. Ages ago, the volcano on nearby Santiago Island erupted, spewing rocks and forming what is known as a "spatter cone." It's essentially a mountain made of lava and rocks from an erupting volcano. Over time, the mountain was eroded away and the ocean carved a channel between the Santiago Volcano and its spatter cone child. Lava floes on Sombrero Chino are more recent and have nothing to do with its formation. Sombrero Chino is still very close to Santiago Island and boats anchor in the clear blue channel. The visitor trail starts at a gorgeous beach: look for bright red Sally Lightfoot crabs and marine iguanas. The path goes past a colony of endemic Galapagos sea lions before passing a lava field: look for the lava cactus growing in the cracks. On the beach, keep your eyes open for the American Oystercatcher, a wading bird with a distinctive orange beak. On the trail, you may see lava lizards. The trail has a fantastic reward at the end: a gorgeous view of a cliff, where waves crash into the shore below. Among veteran guides, Sombrero Chino is known as an excellent snorkelling spot. Protected by the larger Santiago Island, the water is fairly calm, but still deep enough to attract some spectacular marine life like white-tipped reef sharks. Very lucky snorkelers may also see a rare Galapagos Penguin! 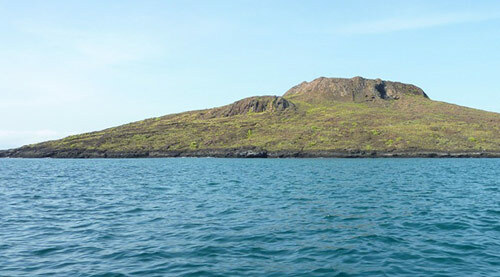 In spite of its good location, Sombrero Chino receives fewer visitors than other Galapagos sites. This is because it's semi-protected by the Park service. Such a small island is more vulnerable to too many visitors, and access is restricted to a select few visitor ships in order to limit damage to the fragile ecosystem. The lava can be rough, so visitors to Sombrero Chino will want good walking shoes.